This series is by far one of the best gundam series of the 2000s. 4 male characters, each with their own backstory, on a path to world peace through war and destruction. The animation is very well drawn from end to end, and has really good battle sequences. I will say that in season 1 and 2 they have "certain unnamed sequences" that could've gone entirely different and better ways for greater emotional effect, but overall it still delivers enough impact to draw up a tear or so. Oh yeah almost forgot. After the 2nd season, there's a movie called "Awakening of the Trailblazer" that you'll need to watch in order to bring the animated series to a close. The movie should've been multiple 45 min animations but they condensed it into one which leaves a lot of side lore, after lore, and crucial information lost. Hope you enjoy being a Gundam like Setsuna does! 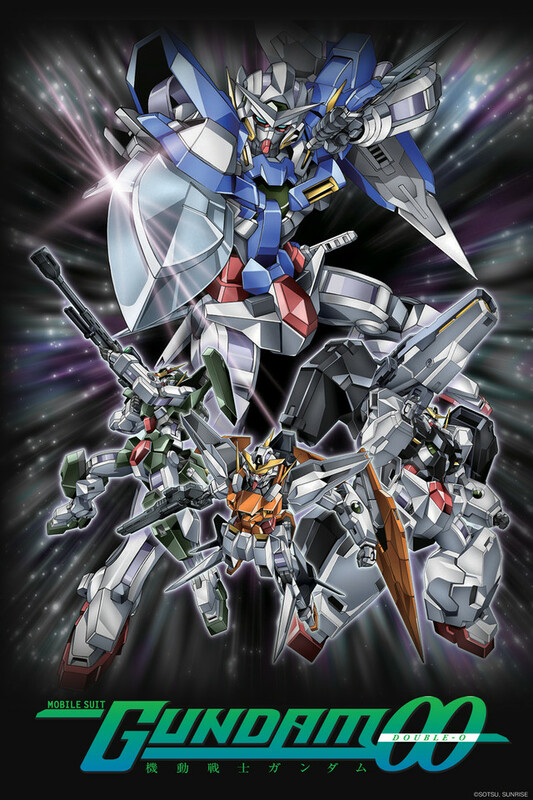 The best stand alone Gundam series. This show hits all the right notes. It has great character development, strong themes, outstanding world building, great visuals and action. Like many sci-fi and Gundam series in particular this show delves heavily into the morals of war, and despite what many who haven't watched much Gundam might think, the series overall is extremely anti-war, highlighting the horrible sadness and destruction wrought by it. 00 takes it even further dealing with child soldiers, terrorist victims, and victims of cruel human experimentation. While the show does have a few faults, such as a certain old man being just a bit more omnipotent than is believable, and a pair of brothers who blatantly look too much alike and are too similar in temperament... these issues fail to significantly detract from an all around outstanding show. Also, the heavy themes and rather dark topics in this show are probably not for everyone. It's not as dark as other anime sure, but it's definitely not a "happy feel good" anime. The animation holds up exceptionally well. Despite first airing a decade ago, if this were a new show releasing this year, I doubt anyone would question it, and in fact many would likely still compliment it. The music also does well, consistently matching and setting the mode and expertly woven into the story, rather than being abruptly being forced into scenes. If there were a single stand alone Gundam series to pick to jump into the franchise having never watched it before - this is certainly an excellent choice! This is by far the best of what the gundam series has to offer. For over twenty years I've watched the multiple gundam series however, this one is truly perfect! The story of a few vs the world, the interesting technology that is adequately explained and consistent, character development and overall quality make this one of the best animes around. The tone of the show really changes between seasons which is great because it keeps things from becoming stale. I highly recommend this series as well as the movie which has the final ending, the tie in manga Gundam 00F is great to read if you want to learn more about what celestial being was before and after season 1. Fun Fact: The english dub voice for the protagonist Setsuna F. Seiei is the same as the legendary Amuro Ray from the original Gundam 0079. One season into this series and I still don't understand why it's rating is so high. In no way is this a bad series but it really isn't that good. Celestial Being is made up of a bunch of wishy-washy angsty teens who were specifically selected for no reason at all. They are constantly being beaten despite supposedly having superior tech and what not. Let me also address Saji and Louise. After 20 episodes these characters still have no purpose and I have no idea why they are in this series. At this point I'm pretty sure they will play some part in the future but honestly I don't care about them at all. All in all this is an average series. Producers fail to understand that they should make you feel attached to characters before killing the entire line up. I never felt as emotionally invested in an anime as I have with Gundam00. You quickly fall in love with some of the characters and hate others for the manipulating, backstabbing, characters that they are. The moral stand point is heart wrenching at times and you often find yourself pondering about things a little closer at home. The Plot is innovative and keeps you watching and guessing again and again, and at the end you feel that a part of you has ushered in a new age of Gundam. Perhaps one of the best entries in the Gundam Pantheon. Although Seed is undoubtedly the more popular show (for better on worse depending on who you ask), Gundam 00 remains as one of my favourite entries in the Gundam franchise. Where Seed was essentially a reimagining of the original Mobile Suit Gundam, Gundam 00 is more or less a re-imagining of Gundam Wing. Like Gundam Seed before it, the basic plot is similar to an older show, in this case Gundam Wing. However, the overall structure is very much it's own show, with themes including the dangers of religious warfare, child-soldiers, "war in the name of peace" along with several other ideas and concepts (don't worry, it's not as convoluted as I made it seem). That is to say, the show still has plenty of thrilling action sequences involving the titular "Gundams" ranging from fast melee combat to large laser battles in space. Furthermore, the protagonist (Setsuna F. Seiei (a name you will know VERY WELL by the end), while occasionally an "edge-lord" is still a decent character and surrounded by a great supporting cast of equally eccentric and entertaining characters (Patrick has to be one of my favourite comedic foils in the entirety of Gundam). Character designs are sharp and the mecha designs are VERY extravagant for Gundam standards (which is a nice change of pace from the usual Gundam aesthetic) and the show is pleasing to look at with a good colour palette and decent backgrounds. An absolute must-watch if you are a fan of Gundam or are wanting to get into the franchise as a whole. This is definitely better than most other Gundam series in terms of plot and overall design. That being said, it still follows the classical bad anime progression trope, where ever new conflict is "This machine is the most powerful built, it will destroy you" followed by "our machines become stronger through the power of ______!" repeated every two episodes. It's basically dragon ball z but with robots. The storyline and main characters are well done, though nearly all of the villains are incredibly flat characters, some with infuriatingly tropey attitudes. If you're a fan of Gundam, it's worth the watch. If you can deal with all of overdone tropes that are sprinkled throughout the entirety of this anime (there's a lot of them), it's worth the watch. New to Mecha genre? This is a good place to start. This is a series that really did an excellent job at character, storyline, and weaving conflict throughout in a way that felt intentional and meaningful. I grew to appreciate many of the characters and their stories and struggles. If you haven't seen a mecha show before, I would recommend this one as a good place to start so you aren't thrown off by terrible plot development or extensively recycled animation sequences that can be a pitfall of some other mecha shows. Its a really good gundam that is a little hard for me to recommend. A part of me is like if you like gundam then watch but i think that's the wrong way to do this. It has a meaning full story and looks at the affects of war in different way than most gundam series. I would have to say its a relevant gundam but not exactly something for even most gundam fans or mehca fans, even less for non mecha/ war series fans. Well maybe if you like war stories you should watch it?.